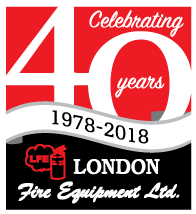 Over the past 40 years, we have been providing quality fire protection services to the commercial and industrial sectors as well as government, fire departments, restaurants, school boards, property managers and the general public. How do I contact London Fire Equipment for my free no obligation quotation? Why are the insurance companies and some fire departments informing restaurant owners to upgrade older fire suppression systems? How often do Fire Extinguishers need to be recharged ? Can Fire Extinguishers and Co2 Cylinders be refilled while I wait? What do I do if my cylinder needs Hydrostatic Testing? My Restaurant is equipped with a Dry Chemical Fire Suppression System in the kitchen exhaust hood, Is this type of system acceptable? I purchased a wet chemical Fire Suppression system for my kitchen exhaust hood in 1994 before the ULC test protocols were changed. Is my older wet chemical system still compliant or do I need to upgrade the system to current standards? How often do I need to have my kitchen hood Fire Suppression System checked? How often should we test the emergency lighting in our building? Are discounts available for large orders or maintenance contracts? Answer: We can be contacted by clicking on our contact us button located on any page within this site at the top of the page or on the lower left section of the page or by phone at 519.652.6913 or toll free at 1-800-403-9690 and ask for a visit for quotation purposes. Answer: Ontario fire code regulations state that fire extinguishers must be inspected monthly. Answer: Changes in commercial cooking methods in Canada are due to the fact certain fire suppression systems currently installed in restaurant cooking areas may not provide adequate fire protection. The two changes in commercial food preparation techniques that have the most impact on fire protection are the use of vegetable cooking oils for frying and the use of "energy efficient" appliances. Vegetable oils burn at higher temperatures than animal fats and create fires that are more difficult to extinguish. Energy efficient cooking appliances and highly insulated fryers help keep cooking oils and metal appliances hotter for longer periods. This also contributes to more difficult in fire extinguishing control. In the past, fire suppression systems were not designed with those specific hazards in mind. With this higher fire suppression difficulty it was necessary to implement new test protocols. On November 21, 1994, Underwriter Laboratories of Canada adopted a new standard called ULC1254 . All manufacturers wanting to sell ULC listed fire suppression systems after that date had to resubmit their systems for full ULC testing. With the significant changes in the design of fire suppression systems were then required to pass the more stringent ULC testing ULC test protocols produce a more intense fire that was more difficult to extinguish than the previous ULC protocols. During preliminary testing, it became apparent that cooling was a critical factor in successful extinguishments and containment of the more modern cooking fires. To achieve the required cooling effect, the design of the suppression units had to be enhanced to increase the amount of wet chemical extinguisher agent to extinguish the test fires involving fryers. Wet chemical extinguishing systems with their newly designed systems with increased supplies of extinguishing agent and fire smoldering characteristics, were effective in extinguishing ULC1254 test fires. The older wet chemical designs, dry chemical systems and water sprinkler spray devices were not. The ULC1254 standard does not require replacement or upgrading of older (Non-ULC1254) systems, however many insurance companies and fire departments may require older systems to be upgraded or replaced. According to ULC, older non-ULC1254 systems installed to protect hazards involving high efficiency appliances, or where vegetable oils are in use, may pose the same risk to life safety as non compliant systems do. The system was installed in compliance with the terms of its original listing and manufacturers installation manual. Approved replacement parts and recharge agents are available for servicing as per N.F.P.A. Standards are met. No changes to the original cooking equipment or exhaust hood(s) have occurred since the system was installed. The Fire Department and Insurers accept the Non-ULC1254 system design. How often do Fire Extinguishers need to be recharged? Answer: Pressurized Dry Chemical Fire Extinguishers need to be recharged every 6 years, after any use or when the pressure gauge indicator is pointing to the recharge area. Can Fire Extinguishers and C02 cylinders be filled while I wait? Answer: London Fire Equipment Ltd is fully equipped to perform Hydrostatic Testing of high and low pressure cylinders. Just bring your cylinders in or call us for pickup. The turn around time is about 3 days check out our cylinder re qualification section for additional information. Answer: Most Dry Chemical Systems are now obsolete and can no longer be maintained in accordance with manufacturers specifications or N.F.P.A. requirements. Many insurance companies will not insure restaurants unless the systems are compliant with current codes and standards. Fire Department Authorities may order building owners to upgrade older obsolete systems. We recommend that all older dry chemical systems and non-compliant wet chemical systems be upgraded to current fire code and N.F.P.A. Standards. Answer: The answer will depend on the requirements of the Authority having jurisdiction (Your local Fire Department or Insurance Company). In our opinion, if the cooking equipment has not changed and your current system was installed properly and we can still purchase recharge chemical and replacement parts, then your current system is acceptable. Answer: Yes, Please contact Pat Watson with your specific requirements and we will be happy to provide a quotation based on your quantities and/or service requirements. **Emergency Service is available 24/7, call 519-652-6913 or 1-800-403-9690 and listen to the message for instructions. Our office is closed on weekends and holidays.